Agile remodelado trams are well suited to the steep, narrow and twisting streets of Lisbon's hill neighborhoods. Lisbon, Portugal’s ancient capital, aims to reshape the city for people, not cars. This guiding principle grounds Lisbon’s award-winning master plan, which is steadily greening every aspect of Lisbon from transportation and redevelopment to energy, resilience, biodiversity and waste management. As a result, the European Commission selected Lisbon as the European Green Capital for the year 2020 (Lisbon 2017; RPS 2018). In the past, Lisbon subscribed to a traditional “predict-and-provide” transportation philosophy that promoted car centricity and auto dependency. 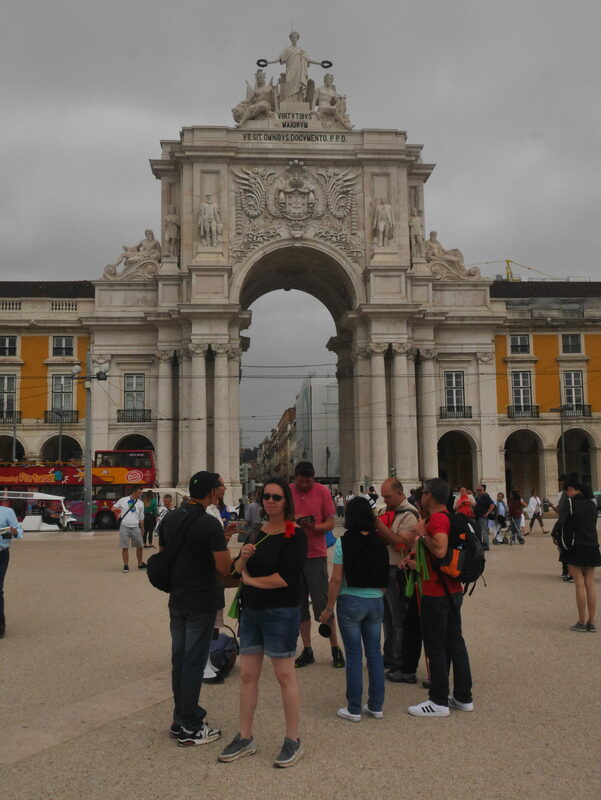 But with the adoption of its city of neighborhoods mantra in 2009, Lisbon now nurtures multifunctional, walkable neighborhoods connected by bicycling networks and public transport. 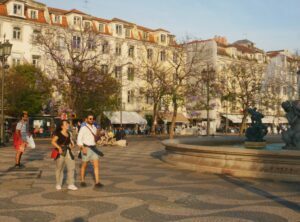 As a sign of this shift, the city completely pedestrianized its Main Square, Praca do Comercio, creating a public space now lined with shops and restaurants adjacent to the riverfront (Lisbon 2017; O’Toole, McEvoy & Campion 2017). 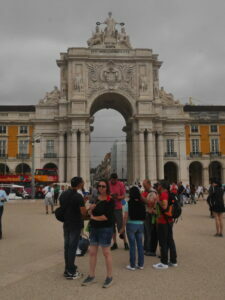 Lisbon’s goal of pedestrianizing neighborhoods included the elimination of cars from its main square, Placa Comercio. As of 2017, the city had created or restored squares, mostly for pedestrian use, in 21 neighborhoods, established four car-restricted zones and reduced speed limits in seven districts to 30 kilometers per hour (18.6 miles per hour). To increase pedestrian travel, which accommodated 19 percent of all trips in 2016, Lisbon is improving sidewalks and crosswalks as well as installing new elevators and escalators in historic neighborhoods with challenging topography. The city recently retooled 90 km of existing cycle lanes and added 60 km of new cycle lanes as well as six new cycle bridges, prompting the percent of trips taken on bicycles to rise by almost 800 percent in a single year. As of 2017, Lisbon’s bike share program offered more than 1,400 bikes at 140 stations (Lisbon 2017). Lisbon’s public transportation system mixes old and new technology. Mule-drawn trams first appeared in 1871 and by 1960 Lisbon had a fleet of 405 electric tram cars plying a 76 kilometer network. Many of the old tram rails have since been replaced by subways, buses and high-capacity trams. 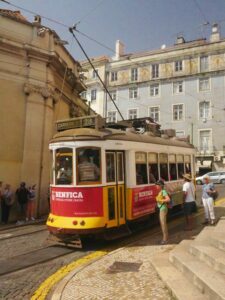 But five tram lines still use small, agile cars reminiscent of their 19th century predecessors which are ideal for navigating the steep terrain and narrow, twisting streets of Lisbon’s historic districts (Laidlar 2018). These quaint remodelado trams provide a tourist attraction as well as serving everyday mobility needs. Today, over 93 percent of all residents live within 300 meters of a transit line with high frequency service and public transportation already accounts for 35 percent of all trips. The city offers free public transportation to children under 13 and discounted passes for the elderly. In 2016, the system carried 140 million passengers (Lisbon 2017). Agile remodelado trams are well suited to the steep, narrow and twisting streets of Lisbon’s hill neighborhoods. Lisbon’s green structure includes parks, open space and an ever-evolving waterfront. As of 2016, public green space occupied over 20 percent of the city’s total land area and 80 percent of all residents lived within 300 meters of green areas of all sizes. Open space here maximizes multiple benefits including climate mitigation/adaptation, biodiversity, floodwater control and other green infrastructure goals. Since 2016, Lisbon’s 2,775-acre Forest Park has been certified by the Forest Stewardship Council (Lisbon 2017). Beginning in the 1990s, Lisbon has focused on linking open space into nine green corridors. The first corridor connects Forest Park with the city center by joining eight separate parks and squares. By redeveloping brownfields and underutilized industrial sites, the city has already transformed large sections of the Riverfront Green Corridor which comprises the entire shoreline of the Tejo River on the southern and eastern edges of Lisbon. 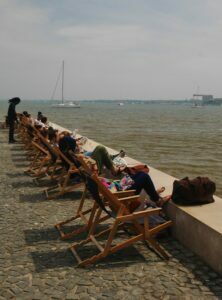 Adjacent to the city center, Lisbon converted an old boatyard/parking lot into a pedestrianized promenade called Ribeira das Naus where people can exercise, stroll or just sit and relax with a drink beside the river (Lisbon 2017). Five miles upstream, Lisbon remediated an 840-acre area along three miles of the riverfront that was once home to industrial buildings, oil tanks, warehouses, a slaughterhouse and a dump. Today, this neighborhood mixes housing, shopping, services, theaters and businesses, evolving into an economic hub that high tech companies find particularly attractive. Roughly one third of this district is reserved for greenspace and designed to create an ideal waterfront setting for Lisbon’s spectacular aquarium (O’Toole, McEvoy & Campion 2017). Lisbon transformed a brownfield in the Riverfront Green Corridor into a neighborhood of multiple uses including this unique aquarium. In its fight against climate change, Lisbon aims to be carbon neutral by 2050. It was the first European capital to subscribe to the Covenant of Mayors for Energy and Climate. Between 2002 and 2014, energy consumption dropped 35 percent partly due to the Great Recession but also because of city initiatives including reduced municipal taxes for new or rehabilitated buildings that achieve an “A” energy rating. 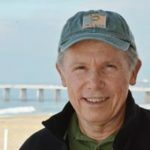 The city is lowering emissions in the transportation sector by shifting from automobile dependency to greater reliance of walking, bicycling and public transportation. Lisbon also uses its green corridors to fight the heat island effect and its associated energy demands. The Lisbon Solar City campaign aims to grow photovoltaic generation fourfold by 2021 with the help of the Lisbon Solar Platform and Lisbon Solar Map, which depicts the potential for capturing sunlight throughout the city. Logically, the city sees its European Solar Capital brand as an economic development tool that attracts entrepreneurs, innovators and investors as it expands the use of renewable energy (Lisbon 2017; RPS 2018). Lisbon uses green infrastructure to adapt to climate change. The city’s floodwater management strategy focuses on nature based solutions including rainfed meadows that promote biodiversity while guarding against flash flood damage. In the nine green corridors, community gardens and green space often replace impervious surfaces to convert runoff into infiltration. Lisbon also employs an aggressive tree planting program as well as its ongoing creation of green corridors to fight the life-threatening effects of rising temperatures. In anticipation of further water scarcity, Lisbon is implementing a wide range of conservation measures including emphasis on drought-tolerant landscaping and the use of recycled water for irrigation and street cleaning (Lisbon 2017). 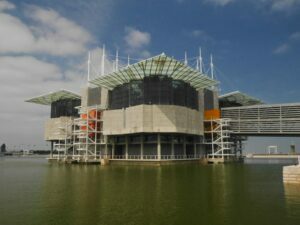 Lisbon uses the green structure of its 2012 Master Plan to protect, enhance and connect 45 areas of significant biodiversity. The 110,000-acre Tagus River Estuary, a Natura 2000 site and wetland of international importance, links with the Riverfront Green Corridor, which extends along the entire southern and eastern border of the city. Restored fields and drainage ditches now serve as links in the Peripheral Green Corridor and Rio Seco Western Corridor which in turn connects with Forest Park, where Lisbon is reducing speed limits and converting roads to bike paths in order to create a better relationship between humans and other forms of nature. Protecting biodiversity in the green corridors also improves outcomes for climate change mitigation and resilience to the growing threat of heat, drought and severe storms, which is one of the many reasons why the Lisbon Master Plan won an award from the International Society of City and Regional Planners (Lisbon 2017). As part of the revitalization of its riverfront green corridor, Lisbon converted a parking lot into a linear park. Lisbon is making progress on waste reduction and management. A vacuum collection network in northeast Lisbon is the largest of its kind in the world. The city incinerates over 75 percent of household waste, recovering enough energy to meet the demands of 150,000 residents. With the adoption of its Municipal Plan against Food Wastage, the city joined the Refood movement which organizes 900 food donors and 4,000 volunteers in a program that collects unused food from restaurants and businesses, serving over two million meals to 2,000 families every year. In addition to being good citizens, businesses are further motivated to reduce and reuse by tariff formulas that penalize waste disposal. As a result of these and other programs, per capita waste generation dropped over 15 percent between 2001 and 2016 (Lisbon 2017). The city of neighborhoods vision nicely positions Lisbon to achieve multiple sustainability objectives, as proven by its title as the 2020 European Green Capital. It also illustrates the strategy behind Ecocity Builders’ very own Ecocity Standards. Lisbon’s 2012 master plan establishes that walkable neighborhoods are the logical building blocks for creating a city for people. Mixed-use, diverse neighborhoods facilitate access by proximity, allowing residents to reach schools, shopping, work places and other everyday destinations on foot or by bicycle. Connecting these neighborhoods with green corridors provides options for eco-mobility rather than car dependency and opens up an array of other green infrastructure benefits including reduced use of fossil fuels, lower greenhouse gas emissions, resilience against rising temperatures, defense against floods, improved water quality, biodiversity and, ultimately, improved quality of life. Laidlar, John. 2018. 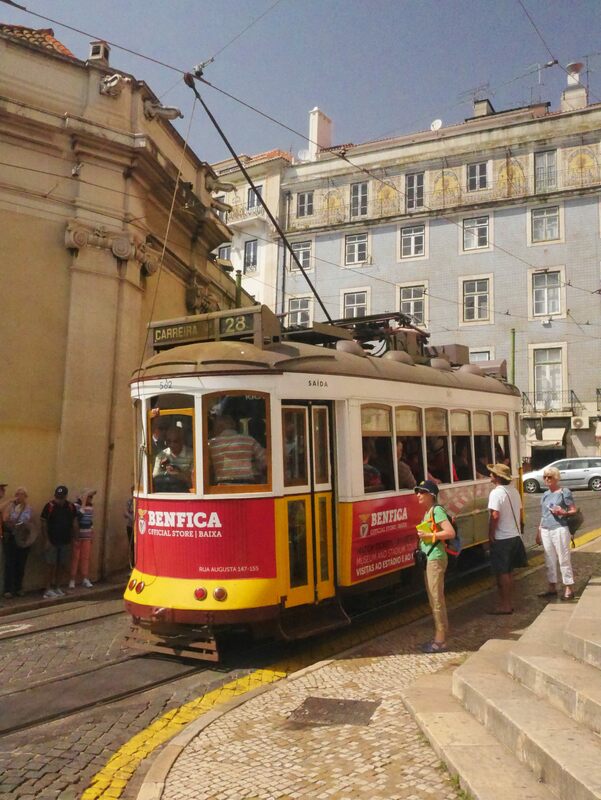 Lisbon Trams Part Two: Trams of the Past. Luso Pages. Accessed on October 28, 2018 from http://www.lusoweb.co.uk/listrams.htm. Lisbon. 2017. Application for European Green Capital Award 2020. Accessed on October 24, 2018 from http://ec.europa.eu/environment/europeangreencapital/winning-cities/2020-lisbon/15210-2/. O’Toole, McEvoy & Campion. 2017. Urban Environment Good Practice and Benchmarking Report – European Green Capital Award 2017. Accessed on October 26, 2018 from http://ec.europa.eu/environment/europeangreencapital/wp-content/uploads/2013/02/MDR0763Rp0035_Good-Practice-Report-2017_F01_for-web.pdf. RPS. 2018. Expert Panel Technical Assessment Synopsis Report: European Green Capital Award 2020. Accessed on October 24, 2018 from http://ec.europa.eu/environment/europeangreencapital/wp-content/uploads/2013/02/EGCA_2020_Technical_Assessment_Synopsis_Report.pdf.